THROUGH AUG. 11: ARTIST MEGAN DAVIS TAYLOR. “A Few of My Favorite Things” featuring furry (or feathery) friends. Portraits of chickens, alligators, possums and pets will be exhibited. Central Artstation, 801 Crockett St., Shreveport. Visit www.shrevearts.org. THROUGH AUG. 19: HUMAN. This photography exhibit by Hunter Sloan is a collage of images that seeks to capture and interpret the uniqueness of self. It shows not only the skin, but what's beneath the skin along this journey. 10 a.m. to 5 p.m., Wednesday, Thursday; 10 a.m. to 7 p.m., Friday, Saturday; 1-5 p.m., Sunday. R.W. Norton Art Gallery, 4747 Creswell Ave., Shreveport. Call 865-4201. THROUGH SEPT. 15: “ILHABELA.” A solo exhibition with artist Madeline Marak. An artist reception will be held from 5-8 p.m., Aug. 1. Light hors d'oeuvres and libations will be served. Lake St. Gallery 413 Lake St., Shreveport. Visit www.theagoraborealis.com. THROUGH SEPT. 25: “CONTAINED” CALL FOR ARTISTS. 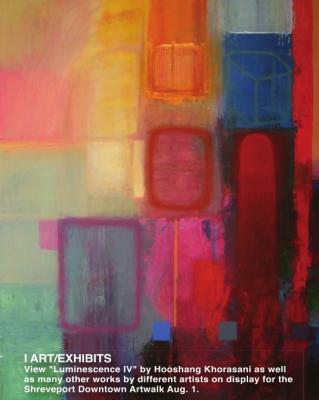 The Bossier Arts Council is looking for local artists to submit works for the “Contained” exhibit. This themed show will explore big art on a small canvas. All works must be 12x12 and sold for $50. Let’s see how well you handle being contained within the boundaries of a small canvas. 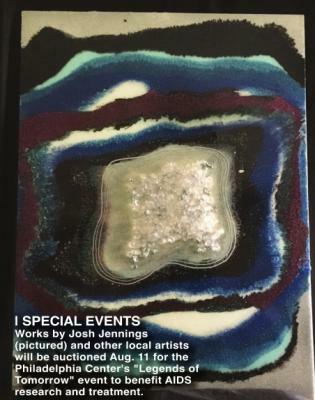 The juried gallery is aimed at introducing our community to a variety of artists' genres while highlighting some of our region’s most talented artists. Artworks will be on display in the East Bank Gallery from Oct. 3 until Nov. 30. Free submission for BAC members and students, and $10 submission for non-members. All completed works must be dropped off at the Bossier Arts Council, 630 Barksdale Blvd., Bossier City, by noon, Sept. 25. Call 741-8310. THROUGH JULY 22: MONSTERS, MYTHS & LEGENDS. The George Rodrigue Foundation for the Arts invited high school juniors and seniors to bring a monster, myth or legend to life through their artwork. 650 students entered: 16 were chosen to share in the scholarships and the finalist works will be shown in this exhibit. 10 a.m. to 5 p.m., Wed., Thurs. ; 10 a.m. to 7 p.m., Friday, Sat. ; 1-5 p.m. Sunday. R. W. Norton Art Gallery, 4747 Creswell Ave., Shreveport. Call 865-4201. BY AUG. 1: DIGIFEST SOUTH CALL FOR ARTISTS. The Bossier Arts Council announces a Call for Digital Artists for the annual DigiFest South Art Show & Competition. The event includes an art exhibition and competition by some of the areas best digital artists. DigiFest is aimed at showcasing a variety of digital art genres made possible by the latest technologies. Categories include digital photography, graphics, digital lagniappe. Requirements: There will be an entry fee of $10 per submission. (Fee is waived for students/military with valid ID only.) Limit of two submissions. All artworks must be digitally submitted by Aug. 1 at 4 p.m. Winners in each category will receive $100 in cash and prizes. Those interested in learning more can call 318-741-8310 or visit www.bossierarts.org. AUG. 1-SEPT. 31: THE LIBERTY COLLECTION. Artist Drék Davis uses color that highlights both the real and imagined world that we live in with the duality and dichotomy that is Americanness. A free opening reception is from 6-8 p.m., Aug. 10, at Bossier Arts Council, 630 Barksdale Blvd., Bossier City. Visit www.bossierarts.org. AUG. 1: SHREVEPORT DOWNTOWN ARTWALK. Tour historic spaces and meet artists and purchase locally produced art. Food, drinks, historic talks, sketch sessions and more. 5-8 p.m. Visit www.downtownshreveport.com. AUG. 7-11: OUTLIER: A FINE ART EXHIBIT. Outlier returns to Shreveport August 2018! This compelling fine art photography exhibit features the work of advocacy artist Mollie Corbett and includes photographs and stories of courageous sexual assault victims. 8 a.m. to 4 p.m. The Supper Club, 610 Commerce St., Shreveport. Visit www.outlierstories.com. AUG. 16: BIZ ART OPENING RECEPTION - JANEY MAINES. This free, family-oriented event features a new, local artist each month. 5-7 p.m. Hayter Reynolds, 9045 Ellerbe Road, Ste. 103, Shreveport. Call 698-3000. 318 INFUSED CIGAR LOUNGE: Mike Brown Karaoke, Tuesdays 7 p.m.-11 p.m. 7611 Pines Road, Shreveport. 318-564-3050. AGAVE: No cover. Happy hour Friday and Saturday, 5 to 7 p.m. 2-for-1 well, wine & draft. Lee Mathis, 6-10 p.m., Aug. 2; Southern Roots, 8 p.m. to midnight, Aug. 3,4; Toni & Drew, 6-10 p.m., Aug. 9; Identity Crisis, 8 p.m. to midnight, Aug. 10, 11; DJ Crowd Pleaser, 6-10 p.m., Aug. 16; 8-Track, 8 p.m. to midnight, Aug. 17,18; Chis McCaa, 6-10 p.m., Aug. 23; Bluebirds, 8 p.m. to midnight, Aug. 24, 25; Monty Russell, 6-10 p.m., Aug. 30; Southbound 71, 8 p.m. to midnight, Aug. 31, Sept. 1. Diamond Jacks Casino & Resort, 711 DiamondJacks Blvd., Bossier City. 678-7777. AMERICAN LEGION #14: Karaoke with Jay Couger, 6 p.m. every Tuesday; Karaoke with Dickie T, 6 p.m., every Sunday; AJ and the Two Tone Blues Band, Aug. 24. 5315 Lakeshore Drive, Shreveport. 635-8186. BIG O’S CATFISH & MORE: Mike Brown Karaoke, Thursdays 7-11 p.m. 5765 S. Lakeshore Drive, Shreveport. 636-4443. CANTINA BAR AT BOOMTOWN: Live music from 8 p.m. to midnight every Friday and Saturday. 300 Riverside Drive, Bossier City, La. 318-746-0711. FLYING HEART BREWING & PUB: Housed in a historic building that was once home to Bossier City's Fire House No. 6, the tasting room is open 11 a.m. to 8 p.m., Sunday; 11 a.m. to 9 p.m., Monday through Thursday; 11 a.m. to 10 p.m., Saturday. Ask about hosting your event at the tap room. Books and Brews, which is an open forum book club, takes place on the fourth Friday of the month. 700 Barksdale Blvd., Bossier City. GREAT RAFT BREWING: Open every Wednesday through Friday from 4 to 9 p.m. and Saturday from noon to 9 p.m. Free tours are available at 1 p.m., 2 p.m. and 3 p.m. on Saturdays. 1251 Dalzell, Shreveport. LEE’S: Acts are 8 p.m. to midnight weekdays, 9 p.m. Fridays and 9:30 p.m. Saturdays. 639 E. Kings Highway, Shreveport. 861-2151. LEGENDS THEATRE: Tracy Lawrence, 8 p.m., Aug. 31; John Michael Montgomery, 8 p.m., Oct. 19. DiamondJacks Casino & Resort, 711 Diamondjacks Blvd., Bossier City. 678-7777. NICKY’S MEXICAN RESTAURANT: Wayne’s FM Karaoke, 6:30-10 p.m., Thursdays; AJ and the Two Tone Blues Band, Aug. 11. 7960 E. Texas St., Bossier City. 841-1345. NOBLE SAVAGE: Open 5 p.m.-2 a.m. Weeknight shows start at 8 p.m. On Wednesdays, Joe Nadeau's Blues Jam. Dirty Redd's Open Jam Session featuring area artists playing all-around good music every Thursday. AJ and the Two Tone Blues Band, Aug. 25. 417 Texas St., Shreveport. 221-1781. RED RIVER BREWING COMPANY: 1200 Marshall St., Shreveport. 317-4110. SAM'S TAVERN: 5-Star Karaoke Plus every Friday and Saturday starting at 8 p.m. until. Located at 3816 E. Texas Street in Bossier City. 318-658-9804. SAM’S TOWN LIVE ENTERTAINMENT: Free entertainment all month long. 315 Clyde Fant Parkway, Shreveport. 877-429-0711. THE STAGE AT SILVER STAR: Live entertainment. Gates open at 7 p.m. unless stated otherwise. Eli Young Band, Aug. 25. 1201 Dixie Overland Road, Bossier City. 752-3633. Tickets available at www.outhousetickets.com. ST. CHARLES TAVERN. 5 Star Karaoke Plus featuring Ed Williams, 8 p.m. to midnight every Thursday; 5 Star Karaoke Plus with Deirdra, 9 p.m. to 1 a.m. every Saturday. 2706 Barksdale Blvd., Bossier City. 318-210-7434. SUNDANCE CANTINA BAR AT BOOMTOWN: Live music is from 8 p.m. to midnight; 5 Star Karaoke Plus featuring Ed Williams 7-11 p.m., every Wednesday night; 300 Riverside Drive, Bossier City, La. 318-746-0711. SUPERIOR’S STEAKHOUSE: Live piano music 6-10 p.m., Wednesday, Thursday and Friday; 7-11 p.m., Saturday. Haley Brooke, most Thursdays, many Fridays and Saturdays; Landon Pate, many Wednesdays, Fridays and Saturdays; Morgan Smith, many Wednesdays; The Stilettos, the first Friday of the month. 855 Pierremont Road, No. 120, Shreveport. 219-4123. TIKI BAR: 639 E. Kings Highway, Shreveport. 868- 6355. WHAT’S ON TAP: Happy hour daily 7 a.m. to 7 p.m. 33 beers on tap. 1207 Shreveport-Barksdale Hwy., Shreveport. 869-2422. WHAT’S ON TAP II: Happy hour daily 11 a.m. to 7 p.m. Serving food and 23 beers on tap. 2369 Airline Drive, Bossier City. 747-5505. WANT TO GET YOUR EVENT, BAND OR BAR/NIGHTCLUB LISTED IN “TALK OF THE TOWN”? E-MAIL INFORMATION THREE WEEKS PRIOR TO THE EVENT DATE TO EDITOR@THEFORUMNEWS.COM . ONGOING: SHREVEPORT HOUSE CONCERT SERIES: Shows begin at 7 p.m. 508 Fairfield Ave., Shreveport. 670-3567. Go to www.shreveporthouseconcerts.org. SEPT. 15: JACK WHITE. Tickets on sale now. $69, floor (no seats); $69-$59, orchestra and balcony. 8 p.m. Shreveport Municipal Auditorium, 705 Elvis Presley Ave., Shreveport. Visit www.shreveportmunicipalauditorium.com. 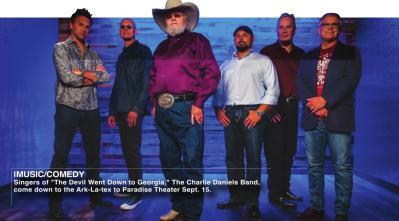 SEPT. 15: THE CHARLIE DANIELS BAND. “The Devil Went Down to Georgia” performers come to Bossier City. $35. 8 p.m. Paradise Theatre, Margaritaville Resort Casino, 777 Margaritaville Way, Bossier City. Visit www.ticketmaster.com. WHOREHOUSE IN TEXAS. A boot-stomping comedy musical starring Miss Mona and the shady ladies of the Chicken Ranch takes the stage. Tickets: $22 adults, $20 seniors, $15 students. Marjorie Lyons Playhouse, 2700 Woodlawn Ave., Shreveport. 218-9978. AUG. 10-12, 17-19: A TEXAS ROMANCE. A funny, poignant comedy by Ellsworth Schave. 7:30 p.m.; 2 p.m., Sunday performances. $12. Stephen W. Slaughter Theatre in Building C on the BPCC campus, 6220 East Texas St., Bossier City. Visit bpcc.edu/ theatre/boxoffice. EVERY SATURDAY THROUGH AUG. 18: SHREVEPORT FARMERS’ MARKET. For the 32nd consecutive year, the market will serve local farmers and the community by providing bountiful and fun-filled weekly markets, live music and ready-to-eat foods. 7 a.m. to noon. 101 Crockett St., Shreveport. Visit www.shreveportfarmersmarket.com. AUG. 4: ARK-LA-TEX SPORTS MUSEUM OF CHAMPIONS 2018 INDUCTION EVENT. Five new members will be inducted into the Ark-La- Tex Sports Museum at an open house and banquet. $45. 5 p.m., open house; 6:30 p.m., banquet. Lobby of Shreveport Convention Center, 400 Caddo St., Shreveport. Call 868-6118. AUG. 4: SHREVEPORT NIGHT MARKET. 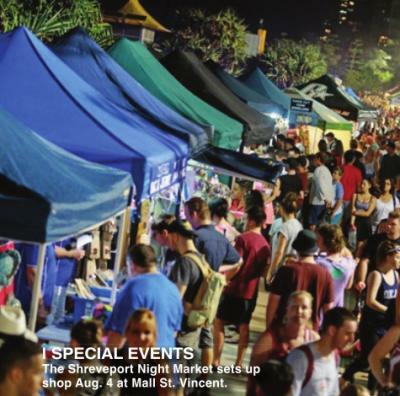 With up to 200 vendors, twinkling lights, goods, food trucks, crafts, jewelry, live music, kids' activities and more. Free. 4-9 p.m. Northeast parking lot at Mall St. Vincent, 1133 St. Vincent Ave., Shreveport. Visit www.shreveportnightmarket.com. AUG. 7: ARK-LA-TEX GEM & MINERAL SOCIETY MONTHLY MEETING. The program features “A look at the Orthoceras Fossils” and a dinosaur bone display. Free. 6 p.m., gather; 6:30 p.m., meeting starts. Aulds Branch Library, 3950 Wayne Ave., Bossier City. Call 464-8270. 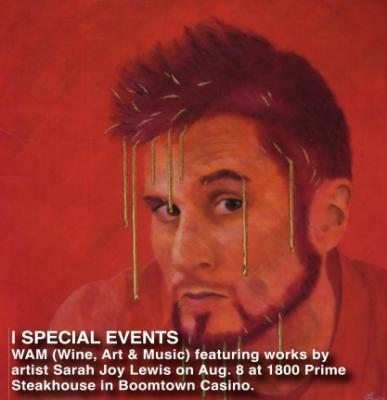 AUG. 8: WAM (WINE, ART & MUSIC). Featuring artist Sarah Joy Lewis, wine tastings, food pairings and live music. $35. 5:30 to 8 p.m. 1800 Prime Steakhouse, Boomtown Casino and Hotel, 300 Riverside Drive, Bossier City. Visit www.bossierarts.org. AUG. 11: 29TH ANNUAL AUCTION AGAINST AIDS. Enjoy a night of intrigue and superheroes and villains along with local art, silent auction, and contests you don’t want to miss all benefitting the Philadelphia Center. 6-10 p.m. Sam’s Town Hotel and Casino, 315 Clyde Fant Pkwy., Shreveport. $50. Call 222-6633. AUG. 11: ARK-LA- TEX GENEALOGICAL ASSOCIATION ANNUAL SEMINAR AND BOOK FAIR. With featured speaker Philip Adderley, genealogy consultant and lecturer, a book vendor with a special selection of genealogy and history books. $40. Registration is recommended. 9 a.m. to 3:30 p.m., Broadmoor United Methodist Church (Pearce Hall), 3715 Youree Drive, Shreveport. Visit www.altgenealogy.com/seminar.htm. Or call 746-1851. AUG. 17-19: GEEK’D CON. The three-day convention welcomes celebrity guests, WWE Hall of Famer Mick Foley, MTV Superstar Bam Margera, actor Erik Estrada and more. The event will include vendors of all shapes and sizes selling collectible items including comic books, clothing, video games, original works of art, handmade items and more. The event will also welcome a variety of professional cosplay groups and will include a full-scale cosplay competition. $10-$20 for day passes and $25 for a weekend pass. Free for children ages 10 and under. 6-9 p.m., Aug. 17; 10 a.m. to 7 p.m., Aug. 18; 11 a.m. to 5 p.m., Aug. 19. Shreveport Convention Center, 400 Caddo St., Shreveport. Visit www.GeekdCon.com. AUG. 18: ARK-LA-TEX GEM & MINERAL ANNUAL SHOW. With fossils, rocks, gems and activities for kids and adults including a scavenger hunt, door prizes, kids' dig and more. $4; kids under 6 and students with ID are free. 9 a.m. to 5 p.m., Aug. 18; 10 a.m. to 4 p.m., Sunday. Bossier Civic Center, 620 Benton Road, Bossier City. Call 464-8270. AUG. 23: YWCA OF NORTHWEST LOUISIANA’S 4TH ANNUAL WOMEN WHO CARE, SHARE. This luncheon will feature Louisiana’s First Lady Donna Edwards as the keynote speaker and a panel discussion on the nuances of being a woman in leadership. $100. 11:30 a.m. East Ridge Country Club, 1000 Stewart Drive, Shreveport. Visit www.ywcanwla.org. 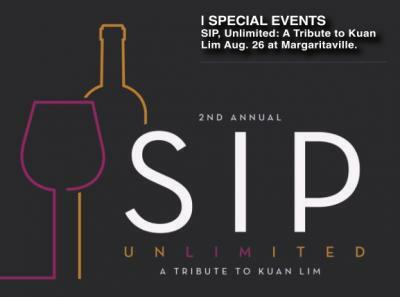 AUG. 26: SIP, UNLIMITED: A TRIBUTE TO KUAN LIM. Second annual wine, food and entertainment experience showcasing favorite area restaurants and wines from around the globe presented by Margaritaville Resort Casino. Proceeds will honor the families of Lucky Palace’s Holly Lim and International Wine & Spirits Perry “Trey” McArdle Woods. Sunday, 2-5 p.m. Tickets $75. VIP experience $150. Tickets can be purchased on eventbrite.com and at the Margaritaville retail store Margaritaville Resort Casino, 777 Margaritaville Way, Bossier City. THROUGH AUG. 31: BIZ ART - JANEY MAINES. This free, family-oriented event featuring a new, local artist each month. An opening reception is from 5-7 p.m., Aug. 16. Hayter Reynolds, 9045 Ellerbe Road, Ste. 103, Shreveport. Call 698-3000. 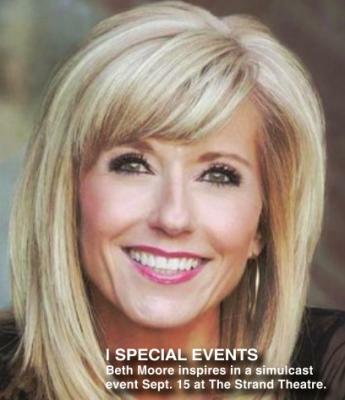 SEPT. 15: BETH MOORE SIMULCAST. Join women from around the Ark-La-Tex for an inspiring and fun-filled one-day event with Beth Moore. $20 for simulcast; $30 for simulcast and box lunch. 9:15 a.m. The Strand Theatre, 619 Louisiana Ave., Shreveport. Visit www.thestrandtheatre.com. OCT. 12-14: PAW PATROL LIVE “RACE TO THE RESCUE.” The top-rated animated preschool series returns with four performances. 6 p.m., Oct. 12; 10 a.m., 2 p.m., Oct. 13; 2 p.m., Oct. 14. CenturyLink Center, 2000 CenturyLink Drive, Bossier City. Tickets on sale at www.ticketmaster.com. DIAMONDJACKS CASINO & RESORT: 711 Diamondjacks Blvd., Bossier City. 678-7777.See Rewards Club for details. Restrictions apply. New Member. Receive up to a $100 refund in the mail. Mail offer based on play. Happy Birthday. Come in on your birthday, swipe your Rewards Club card and receive a present from us. August Promotions. 12th Anniversary Giveaway. Win an Audi Q3 SUV; 11 p.m., Aug. 25. Win $1,000 cash; 11 p.m., Fridays and Saturday. Win up to $500 slot play; 7-10 p.m., Fridays and Saturdays. 12X Entries every Monday; Aug. 6-20. Weekly drawing/earning periods. Grand prize drawing Aug. 1-25. Anniversary Treasures is from noon to 6 p.m. every Tuesday. Win gifts, slot play, cash, points and more! Enroll at Kiosk with 10 slot points. Limited to two swipes per day. Winning Wednesday Drawings with $2,000 slot play drawings is Aug. 1, 15, 29. Five $100 Winners every hour from 5-8 p.m. Winning Wednesdays Gifts is Aug. 8 and 22. Cool gifts with 10 slot points Personal Fan is Aug. 8; Cruzan Coconut Rum is Aug. 22. 50+ Diamond Club is every Thursday. 5 points = 50% off at Legends Buffet or The Grill. 10 points = $5 slot play. 50 points = $10 slot play. 100 points = $15 slot play. 200 points = $20 slot play. Valid for one meal only. Must be 50 years of age or older. Meal discount on same day earned. 12X Points is Aug. 19 and 26. Earn more cash back at the machine. Multiplier caps at 200 points. 10 X is from 5-7 p.m. every Friday. Earn more cash back at the machine. Multiplier caps at 200 points. Your e-mail could be worth $100! Submit your e-mail to the Rewards Club for a chance to win a share of $500! T-shirt Pick Up is from noon to 6 p.m. Aug. 5 and 12. Celebrate 12 years with us with a T-shirt! Enroll at Kiosk with 10 slot points. While supplies last. Limited to one person per day. 12th Anniversary Parties. Win a share of $2,000 cash! Drawings every hour from 5-8 p.m Free beer and pizza, 5-7 p.m., Aug. 9; free margaritas and tacos is 5-7 p.m., Aug. 23. LEGENDS BUFFET SPECIALS: Salute to our troops. 25% off every day at Legends Buffet. Must have military I.D. (active or retired) to receive discount. Not valid on holidays. Cannot be combined with any other offer. Seafood Buffet is Friday and Saturday. $26.99 with Rewards Club Card. HARRAH’S LOUISIANA DOWNS: 8000 E. Texas St., Bossier City. 742-5555. MARGARITAVILLE CASINO AND RESORT: 777 Margaritaville Way, Bossier City. 855-346-2489. www.margaritavillebossiercity.com. SAM’S TOWN HOTEL AND CASINO SHREVEPORT: 315 Clyde Fant Parkway, Shreveport. 811-429-0711. www.samstown.com.